My TF300T has been acting very strange lately. First time - tablet randomly turned off during the night, when I attempted to start it in the morning had to turn it on. Stuck on ASUS first screen. Restarted it around three times until it finally booted into android. It didn't work fine, though - I couldn't use the camera, play videos on it (either on browser, youtube app or internal memory), I couldn't download any app from the shop and when I'd attempt to charge it, the charging logo would get stuck on screen and I wouldn't be able to take it off. The tablet would work in the meantime, but I wouldn't be able to remove the charging icon. I used the factory reset option two or three times but the problem would persist. This went on for around one week and a half until a random restart restored it to its usual functionality. I didn't know what exactly caused it, but seeing as it was back to normal I didn't give it much thought. Second time - this morning (around a month after the initial problem), the tablet froze while playing a youtube app video. It restarted by itself and since then it has been stuck on either the first ASUS screen or the second one. It will not boot into android by any means (used the Power+Vol. Down option to either restart it, wipe the data to return to factory settings) and nothing seems to work. Below, I've attached a pic of it's current state. At this point, I just want to know whether there's anything to be done and if anyone has ever encountered such a bizarre behaviour in a TF300 before since I'd rather not throw this away just yet (the tablet is 3 years old). EDIT: Sorry, came to the forum from a google search and posted in the wrong section, this belongs in the help section. If any mod would be so kind to move this, I'd appreciate it, thanks. Last edited by Yaddo; 12-09-2015 at 05:23 AM. If your tablet is still stock, that is, locked and still with factory recovery, you can try another factory reset from the bootloader menu. If that does not work, the next step would be to reinstall the factory firmware. Procedures for all these things are in our Master Help Guide, linked in my sig. I recommend that once you get the tab working again, you unlock it and install TWRP recovery. It makes problems like this one very easy to solve. I have not meddled with the system of the tablet at all. All software installed on it has been from the shop. I did try factory reset from the bootloader two or three times, it did not solve anything. I will try using the guides to reinstall factory firmware and will report if it solved anything. Any idea on what might have caused this/are these symptoms of something? The same reason your car develops problems over time: use, age, accumulated crud.... I just had a battery die on me on a 13 month old car! Electronic components do not last forever... If the firmware flash does not solve it you probably have a hardware problem. The firmware flashing did not solve the problem. The thing is probably beyond saving now. Please report back with all the messages on your screen, thanks and good luck. 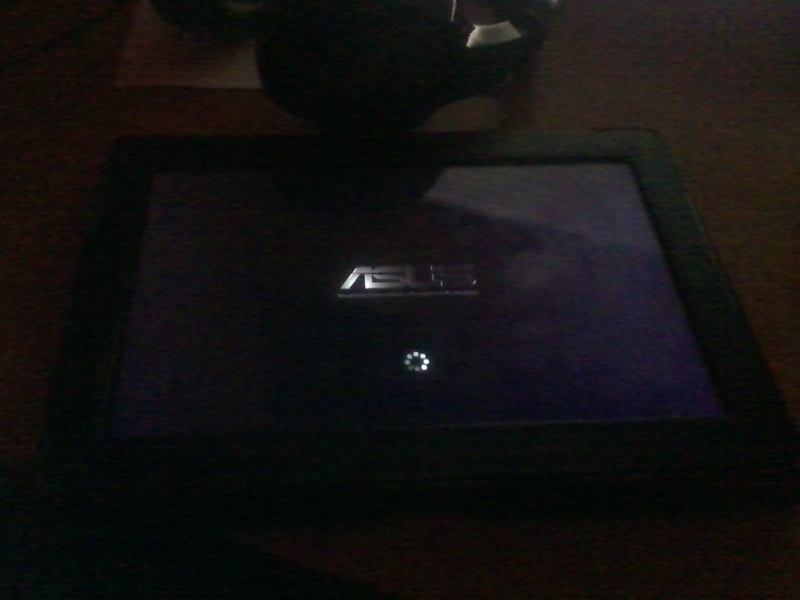 All of the cmds seem to have been succesful, but the problem still persists, tablet freezes on ASUS logo. EDIT: one thing it did afterwards was go on the first logo screen, then to loading and then seemed to boot for one ms. then restarted and went back to the first logo screen. This happened twice in a row, now it's frozen on the first logo again. Last edited by Yaddo; 12-09-2015 at 02:25 PM. [ SOLVED ] TF300T frozen at Logo screen, won't turn off, won't boot up after update.